This week I’m thrilled to be releasing a lovely spring/summer dress doll clothes pattern that can be made into a pretty Easter Dress. Your doll will be the envy of all the other dolls when you take her on the Easter Egg hunt with you. 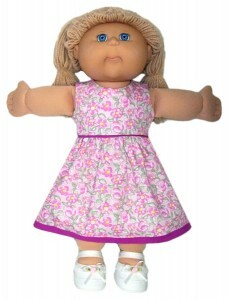 Choose between the American Girl doll clothes patterns size (this pattern will fit other similar 18 inch dolls) or the 18 ½ inch Cabbage Patch Kids doll clothes patterns size. The bodice is fully lined and the contrasting trim creates a lovely feature, or you can use the same fabric for both the trim and the dress for a more subtle effect. Remember, all my doll clothes patterns are downloadable so there is no waiting for the mailman AND they come with full video instructions streamed directly to your computer or IPAD. Yes, I show you step-by-step how to make the outfit so there is no way you can go wrong. 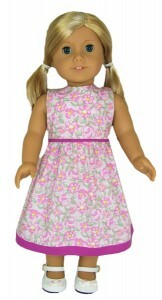 Buy the pattern today and your doll will have a lovely new dress in time for Easter or make the dress up and give it as an Easter present to your special little girl.